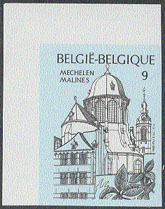 42484 ND BELGIUM (1988) Mechelen*. Imperforate with control number on back. Scott No 1291, Yvert No 2290. 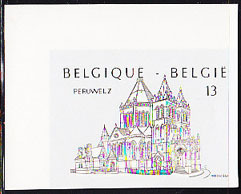 42486 ND BELGIUM (1988) Peruwelz*. Imperforate with control number on back. Scott No 1293, Yvert No 2292. 46918 EP AUSTRIA (1988) Brixlegg 1200th anniversary*. Black proof. Scott No 1435, Yvert No 1758. 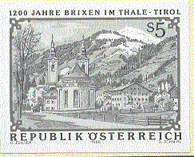 46920 EP AUSTRIA (1988) Brixen-im-Thale 1200th anniversary*. Black proof. Scott No 1437, Yvert No 1759. 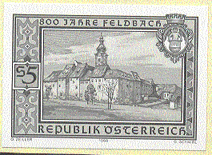 46922 EP AUSTRIA (1988) Feldbach 800th anniversary*. Black proof. Scott No 1439, Yvert No 1763. 46923 EP AUSTRIA (1988) Ansfelden 1200th anniversary*. Black proof. Scott No 1440, Yvert No 1764. 59312 SPE GERMANY (1988) Dusseldorf 700th anniversary*. MUSTER (Specimen) overprint. Scott No 1554, Yvert No 1201. 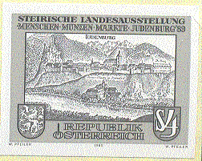 59317 SPE GERMANY (1988) Meersburg 1000th anniversary*. MUSTER (Specimen) overprint. Scott No 1559, Yvert No 1208. 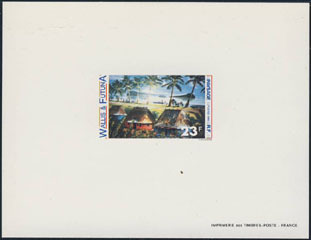 58068 EL WALLIS & FUTUNA (1989) Landscape*. Deluxe sheet, Scott No 387, Yvert No 392. 46930 EP AUSTRIA (1989) Styrian Provincial Exhibition*. Black proof. Scott No 1456. 46931 EP AUSTRIA (1989) Radstadt 700th anniversary*. Black proof. Scott No 1458, Yvert No 1785. 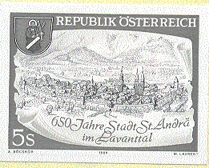 46934 EP AUSTRIA (1989) St. Andra-im-Lavantal 650th anniversary*. Black proof. Scott No 1462, Yvert No 1789. 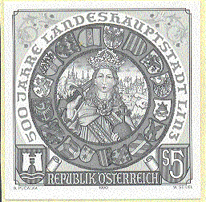 46946 EP AUSTRIA (1989) Wildalpen 850th anniversary*. Black proof. Scott No 1478, Yvert No 1798. 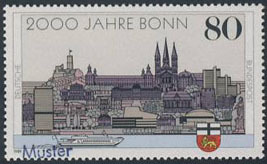 59324 SPE GERMANY (1989) Bonn bimillennium*. MUSTER (Specimen) overprint. Scott No 1568, Yvert No 1234. 59344 SPE GERMANY (1989) Speyer 2000th anniversary*. MUSTER (Specimen) overprint. Scott No 1591, Yvert No 1276. 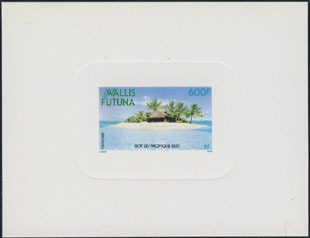 58067 EL WALLIS & FUTUNA (1990) Ilot*. Deluxe sheet, Scott No 394, Yvert No 399. 42509 ND BELGIUM (1990) Antwerp*. Imperforate with control number on back. Scott No 1352, Yvert No 2377. 42512 ND BELGIUM (1990) Lommel*. Imperforate with control number on back. Scott No 1355, Yvert No 2380. 42513 ND BELGIUM (1990) Watermael*. Imperforate with control number on back. Scott No 1356, Yvert No 2381. 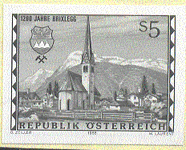 46954 EP AUSTRIA (1990) "Miniature from Market book of Grein" by Schreler*. Black proof. Linz 500th anniversary. Scott No 1490, Yvert No 1812. 46956 EP AUSTRIA (1990) Church*. Arms*. Anthering 1200th anniversary*. Black proof. Scott No 1500, Yvert No 1814.